Yesterday, I woke up nice and early for the Pablo Escobar tour picking me up at the hostel. The tour was supposed to stop by at 8 but ended up picking me up at 8:40. I awoke early-because I always get up early. I didn't have breakfast either, because the main road with restaurants is too far to walk in such a limited amount of time. So Iwaited. It turns out that the reason the bus was late is from waiting for 5 folks who ended up too hungover to make the tour-so it was only 3 of us. I have never watched the Netflix series "Narcos". In terms of history and learning, in the past the fact that I don't watch much tv I was never at too much of a disadvantage. But not here-apparently Narcos viewers would be eaiser to relate to the tour. - By the time he was in his early 20's he was well on his way. He bought a huge apartment building and housed his entire family, bodyguards, etc. - In the early 1990's-the international community was putting pressure on the Columbian government to arrest Escobar-and the government did. But because he did so many favors for the government and the government was corrupt-Escobar built his own Jail, up on the mountain top, where he houses his mother, brother and bodyguards. The jail has two swimming pools, and even an escape hatch with a tunnel down the mountain complete with oxygen if international authorities got too close, which he used. - He is buried in a cemetary in the poor neighborhood he grew up in. - The driver of our van was actually a driver for Escobar. A very nice man, who explaned that he got lots of woman during that time, and preached against getting involved with a man or woaman who was in the mafia. After the tour, I had lunch with the other 2 people on the tour, and then took the cable car to Avri Park. Actually it was a mission of taking the metro to a cable car, riding it for around 1/2 and hour-45 minutes-then transferrring to another cable car, which was around another 45 minute ride, and deposited me in a nature area. I walked around for a little bit. I ran into some people I met on the free walking tour, but other then that, I didn't feel like walking around. The park was beautiful, but for all the time I it took the get there, there was too much I wanted to see in town on this final afternoon. So I took the cable car back to the other cable car back to the metro, and went downtown. I walked along a pedestrian area with lots of shops, and a park in Medellin which our tour guide introduced me to a few days prior. The park was the heart of Medillian, and featured all types of people, ranging from a workshop with kids painting to, according to our guide, addicts sniffing glue. The park was bustling. I walked along a pedestrian street, and ate some native dish of stuff I don't usually eat, which features pig stomach, egg, rice, beans, a hot dog, and other horrible food. It was tasty but I didn't eat all of it. I ran into the tour guide from yesterday, as well as someone from the pub crawl. Then, after dark, I took one final cable car ride-past the barrios. 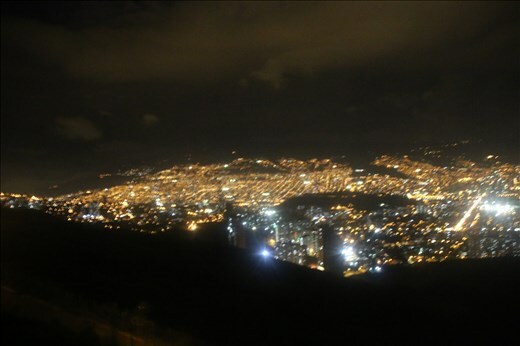 At night it is peaceful, with apart from the others in the cable car, you can hear barking dogs, kids playing soccer, etc as the cable car goes up and down the hills and lights of the city come into view. I returned to the hostel about 10:00 pm-but because it was the last night-I was in no mood to go to sleep. I took a walk to the hostel from the other night, and had some drinks, and met new people, including a girl who was teaching English in Cali, and her boyfriend-both from Utah, and some guy who grew up near me.